We purchased a new Keystone Raptor Toy Hauler 428SP in August 2018 from Camping World of Myrtle Beach. We made two trips with the RV and at the end of the last trip I went on the roof to check the top of the slides for debris before retracting them I noticed bubbles in the roofing material on the slide tops. At the end of the trip when I brought the RV in for additional warranty work I reported the bubbles to the dealer. The service manager informed me that he requested that Keystone under warranty replace the slide motor assembly's (3) and install new roof material on all (3) slides. Keystone's reply was to install drip pans under all motors and to patch roofs. I told the dealer the that repair was unacceptable. He suggested that I call Keystone myself. I spoke with two representive's at Keystone the first said I needed no repairs and the second said drip pans and patches!!! I advised both representative's that their type of repair was unacceptable I asked the second representative where do we go from here and he said I had to call my dealer!!! I have done some research and found out that Keystone has known about this problem since 2017 and continued to install these motor assembly's on there slides!!! Keystone started to use Norco motor Bal-Accuslide assembly's on their slides that leaked oil or grease past the seal. So instead of discontinuing the use of this motor they opted to continue to install them!!! Now that slide roof tops are damaged from this, they want everyone to accept these patches instead of replacing the roof. My feeling is that the patch is a temporary repair that will last long enough to get them past the one year warranty!!! I spoke to roofers that said the roof material they use should last 15 to20 years!!! 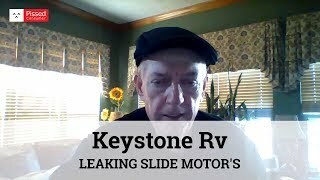 I have been reading different forums and I realize that Keystone has replaced motor assembly's and roofs on some RV's!!! Keystone wants you to believe that the term they like to use about the patches is "meets industry standards" should make us happy with the repair!!! My question is who sets the standard Keystone!!! I would just like for everybody to know that it's TRUE, you do indeed get what you pay for. I mean, what's better than paying tens of THOUSANDS of dollars of your hard earned money for something that's going to repeatedly let you down?! Their furnaces will continue to surprise you, waking you up in the middle of the night to see your own breath! Their customer service? Absolutely no help! Dont like living in below freezing temperatures with no heat? That's fine, because you can take your wonderful new mortgage to a dealership where its bound to sit for days on end waiting for warranty approval work and for parts. But wait theres more!!! In the mean time you just lost your home that your using for work or play (neither in which I would reccomend), and will have to find a place to stay. Which I would love to add, is incredibly easy and convenient when you work 6, 12 hour days every week. keep up the GOOD WORK keystone! Last but not least I would just like to mention that this is the WORST purchase anyone could ever make.....EVER.Thank you for reading! I purchased a brand new keystone hideout 28 foot brand new from rv show dealer said it would be perfect. After getting home noticed numerous defects. None of the doors are installed correctly and bind or won't shut. Staples coming out all over. Furnace ducts full of sawdust and the list goes on. I haven't even had it a month. This company needs to be shut down. I have seen children do better work. I will never buy another. I contacted dealer and they could not get in for four weeks. I did not want to ruin my family trip so we have not taken in yet. To tell you the truth I don't trust them anyway. I have been a builder and mechanic for 35 years and am a protectionist. I am really pissed at myself that i didn't notice these items before I purchased. The whole point is this should never happen to anyone especially to people like myself that has worked there whole life to buy something new and it ends up being trash. I am 53 years old and it was first new toy I have ever had. Anyway shame on you keystone. I have a 2014 Laredo, that I purchased new. Early last year I noticed a soft spot in the floor. After failing to have the company, or my insurance be willing to do something about it, I decided to have a look to see if I could fix what I was hoping would be a small issue. The service dealer here examined it, and determined that I took good of it, maintained it properly, and that the cause of the water entry was from the design of the outdoor kitchen, that allowed water to seep into the screw holes, that were installed on the outside of the rubber seal. I’ve been told It’s a write off, and have no support, no camper, and many many years of payments left! You think YOU have problems ??? 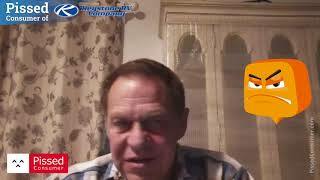 See my YouTube video # 1nn9PUrWEMk. THIS is the kind of JUNK KEYSTONE builds. 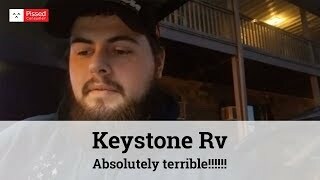 Keystone Rv - A problem the first day it was delivered to us. 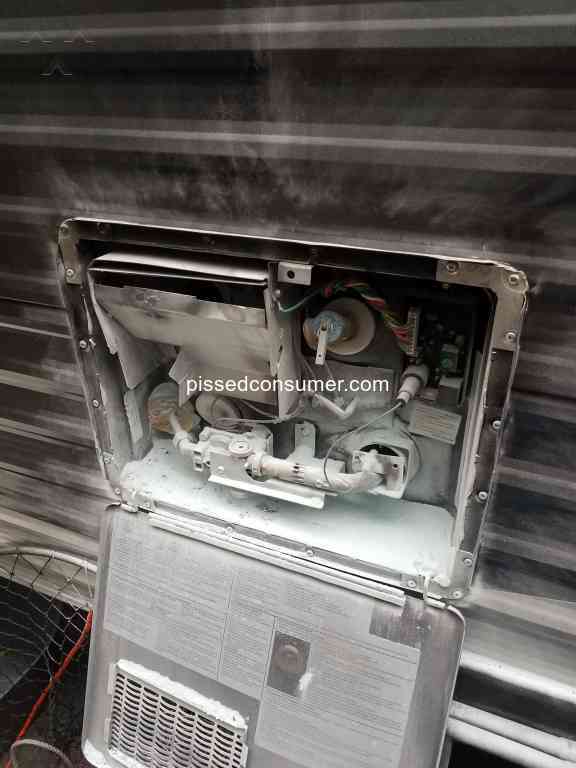 We purchased a 2012 Keystone Residence 7 years ago and since then: -first the awning motor froze, - microwave went next, -the AM/FM radio/CD/DVD player stopped working -as well as the refrigerator -then the microwave, -and the faucets started leaking, -followed by a crack in the shower floor, -followed by the discovery that the hot water lines were dripping under the floor, AND TODAY..... -the grey water tank burst! We can expect the other holding tanks to break soon We do like the design of the Keystone Residence but our unit has become an absolute money pit. Buyer Beware. 2014 Premier - Back Wall separating from roof.